This recipe for quick beef stew makes an economical and filling meal. It is ready to serve in less than two hours. The recipe takes advantage of items from the freezer or leftovers. Onion, beef bouillon and Worcestershire sauce season the stew. It can be served in a bowl along with bread and butter or it can be served over potatoes, rice, noodles, biscuits, cornbread, toast or polenta. It is a perfect meal to serve on a bitter cold winter day. Stews and soups date from ancient times. The only difference between a stew and a soup is that soups usually contain more liquid. The ingredients that can be put in both stews and soups are endless. Whatever meat or vegetables the cook has goes into the pot. By cooking over low heat in liquid for long periods of time tough meats became tender. Another advantage is that stews and soups are a good way to stretch small amounts of meat and other ingredients so more people can be fed. The recipe serves 4 to 3 adults or 2 adults and 2 young children or 1 teenager. The recipe is easily doubled. Leftovers can be turned into a casserole the next day. Heat 1 tablespoon of butter or cooking oil in a large frying pan or Dutch oven over medium high heat. When the butter has melted add the frozen hamburger patties, sprinkle with salt and pepper. Cover the pan and continue to cook. As soon as the underside has begun to brown turn the patties over, salt and pepper and cover. When the patties have thawed enough chop into pieces with a spatula. Add the sliced onion. Stir well and lower the heat to medium, cover the pan. Cook until the onions are tender. While the meat and onions are cooking boil about an inch and a half of water in a sauce pan over high heat. Add the frozen vegetables. Cook until done. Using a slotted spoon remove the vegetables and add them to the meat and onions. Add the water the vegetables were cooked in to the meat and onion a ladle full at a time until the vegetables and meat are covered. Add the beef bouillon and the Worcestershire sauce to the mixture. Stir well and cover the pan. Lower the heat to simmer. Prepare potatoes, noodles, rice of whatever you are planning on serving with the stew. Thicken the stew before serving. Put 3 heaping tablespoons of flour in a small bowl. Add 1/3 cup of tap water and stir smooth with a wire whisk. Stir the stew while pouring in the slurry. Stir over medium heat until the stew has thickened. Lower the heat to low, cover the pan and allow it to simmer slowly until time to serve. 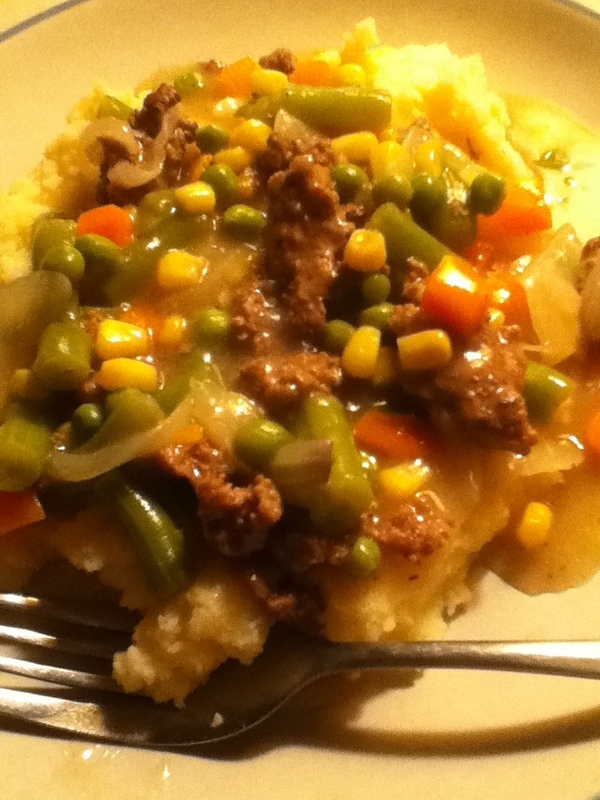 Put a couple large spoonfuls of mashed potatoes on a plate or in a pasta bowl and ladle the stew over. Any type of meat can be used. You could use Spam if you want. Leftover roast would be good. Ham, pork and chicken could be used. Added flavor can be introduced by frying a diced strip or more of bacon and then adding the other meat to that. Casserole for the next day. Pour the leftover stew into a casserole dish. Add 1 egg and a tablespoon of melted butter to the leftover mashed potatoes, beat well and put the potatoes on top of the stew. Mark the top of the potatoes with a fork to make ridges. Bake in a 350 degree F. oven until heated through and the potatoes lightly browned. Shredded cheese could be stirred into the potatoes before putting on top of the stew. Noodle casserole can be made from leftover stew and noodles. Cook the noodles, drain and mix into the stew. Pour into a casserole dish and cover with buttered bread crumbs. Bake in a 350 degree oven for 30 to 40 minutes. If you want cheese on top remove from the oven about 10 minutes before the casserole is done, sprinkle shredded cheese over the top and return to the oven to finish cooking. A great grandmother living in the middle of the United States. My interests include art, needlework, reading, history, politics, and cooking. This entry was posted in Casseroles, Dinner, Food, Lunch, Main Dishes, Recipes and tagged Dinner, Food, Hamburger, history, Lunch, Main Dish, Meat, recipe. Bookmark the permalink.